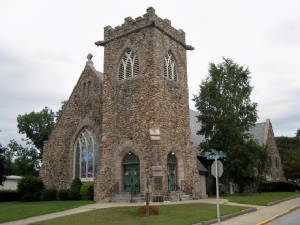 Check out the following interesting things to do and places to visit in Groton Bank. Take a walking tour and visit some of these sites. 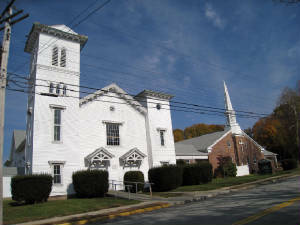 This page also has links to websites of other organizations in Groton Bank that we find informational. If you have a page that you believe should be listed here, or you are part of an organization that would like to work with the Groton Bank Historical Association, please contact us about who you are and what you do! Please click on the site to go its website. Ruins of Revolutionary War Fort Griswold. British massacred patriots, one of the bloodiest battles. 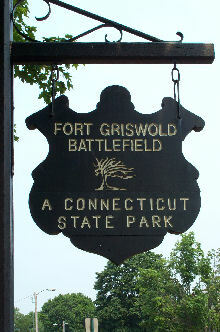 Fort Griswold Battlefield State Park. The ruins of this earthen star fort were the site of a September 6, 1781 Revolutionary War battle, the only major battle on Connecticut soil. The British attack here was a failed diversionary strategy to defend Yorktown. Benedict Arnold led 1600 British forces to New London and Groton, where he quickly overran New London. At Fort Griswold 800 British overwhelmed 165 local militia--including boys in their teens and men in their sixties. This was one of the bloodiest battles of the Revolution. Local men valiantly tried to defend their land, family and community with out any assistance from the Continental Army which Arnold had failed to divert. Although the patriots lost they substantally weaked the British Army of the North--one quarter of the 800 British attacking in Groton were killed or wounded, including several of Arnold's key officers. Six weeks later Lord Corwallis surrendered at Yorktown, VA. Defeated in the south and weakened in the north the Revolutionary War was essentially over, although the Treaty of Paris was not signed until 1783. 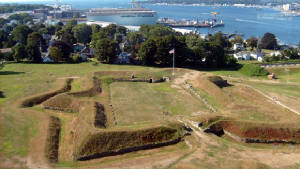 Hence the Battle or Groton Heights, at Fort Griswold, most likely helped to shorten the war. The fort grounds are open all year while the Monument, Monument House Museum and Ensign Ebenezer Avery House are open generally Memorial Day to Labor Day. Groton Monument, dedicated 1830. First U. S. patriotic monument of its kind. Climb to top. Ens. Ebenezer Avery House, c. 1750. Wounded were left here after the battle. You can also visit the Groton Monument, the Monument House Museum and the Ensign Ebenezer Avery House on the grounds of Fort Griswold. 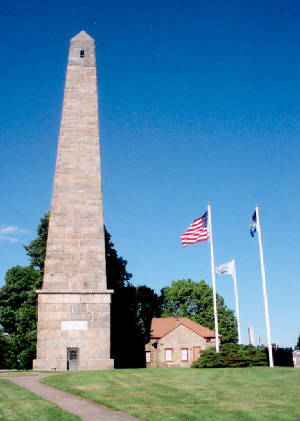 The Groton Monument is the first patriotic monument of its kind in our country, predating the Bunker Hill Monument, Saratoga Monument and Washington Monument. 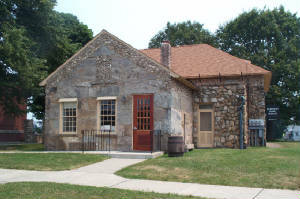 The Monument House Museum established by the local DAR chapter in the 1890s is Connecticut's first museum of historial artifacts that is not a library. The artifacts are related to the September 6, 1781 battle. The Ensign Ebenezer Avery House is a 1750s center chimney colonial, where after the battle of the British, left about 3 dozen of the wounded patriots, including Enz. Avery himself. 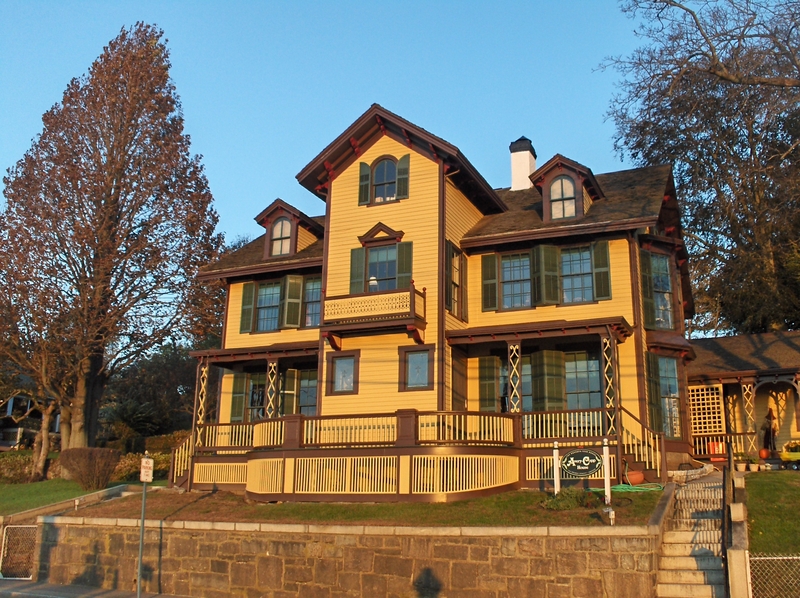 In 1971, this house was moved from its original location at Thames and Latham Streets to Fort Griswold and restored to the period. 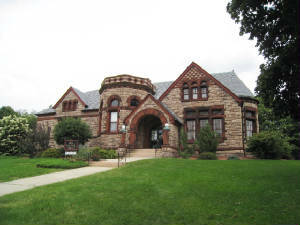 These three structures are open to the public during the summer season--Memorial Day to Labor Day. Other buildings open to the public. c. 1800 on the bank of the Thames River in Groton, Connecticut. The house passed from generation to generation of the same family, and is a wonderful time capsule of local history. 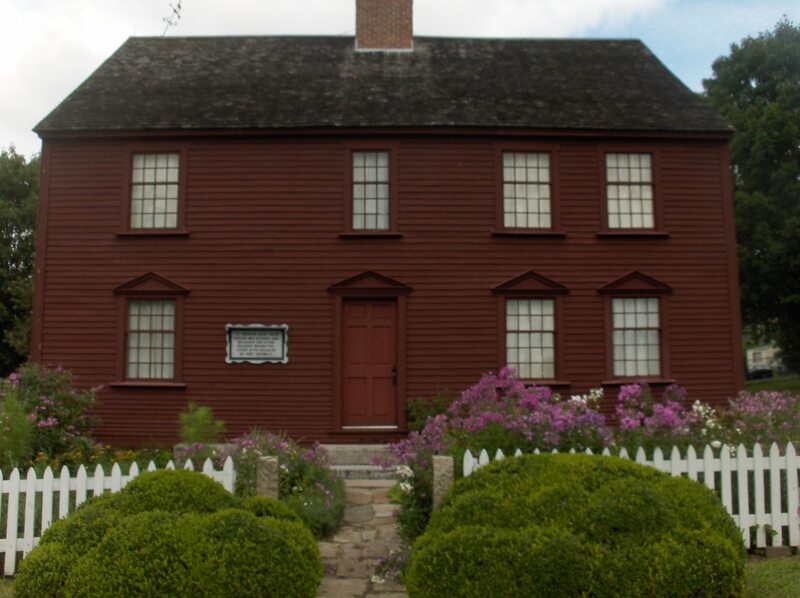 The objects and artifacts within tell the story of life in this lovely Groton neighborhood from just after the Revolutionary, through the Victorian Era, the age of industrialization, mass immigration, the Great Depression, and the years of both World Wars. The museum is located on three acres of terraced grounds overlooking the river with beautiful gazebos and a Carriage House that now contains our archive storage facility. It is open by appointment. 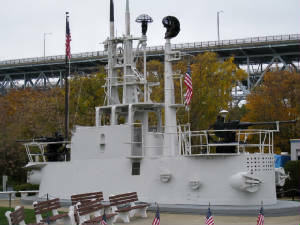 The east bank of the Thames River, a site of almost continuious shipbuilding since the 1690s has been a site for submarine construction more than 75 years. The U.S. Navy Submarine Base was established in Groton in 1916. With these two facilities Groton became known as the "Submarine Capital of the World". Most of our Nation's submarines are built here at the Electric Boat Division of General Dynamics Corporation just south of the historic village of Groton Bank, most submariners have trained at the U.S. Naval Submarine Base about a mile north of the historic village. 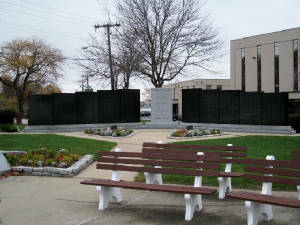 The memorial below is on the northern edge of the historic village of Groton Bank. Take a walking tour. Brochures for a self guided "Historic Groton Bank Walking Tour" are available at various public buildings and some Groton Bank businesses.